With big price reductions on non-genuine Brother products both ink cartridges and laser toner we are now able to offer compatible Brother laser toners at unbeatable prices online. Several new bundle deals have been introduced with the heavy and occasional user in mind. A choice of single, twin or four packs of toner are now available on most of the popular toners and all come with low cost next day delivery of €1.22. Non-genuine ink cartridges and laser toners are ideal for everyday printing both at home and in the office. The laser toners are manufactured to the same ISO standards as the genuine cartridges for a fraction of the cost and savings of up to 40% are not uncommon. 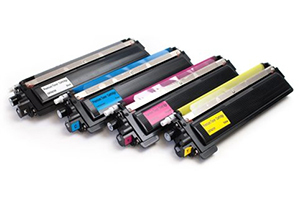 The range of compatible or remanufactured toner cartridges are truly comparable in performance and output with the original brand cartridges. We have many testimonials from our customers regarding quality, performance and reliability. Our laser toners are purchased using reputable suppliers and manufactured in accordance with the trading standards and ISO standards. Toners are checked and inspected with quality control prior to their release on the market. We stand by our products and in the unlikely event of a faulty product we will endeavour to replace the item as quickly as possible or refund your money. Our money-back guarantee is our way of saying we care about our customers and want to keep them! We not only stock a large selection of non-genuine Brother toners but also all the leading printer brands such as Samsung, HP, OKI, Dell, Canon and Epson. Our next delivery on most of our laser toner products means you don’t have to hold stock and this is a big help with cash flow to those businesses and heavy home users who previously had to tie up cash in stock. Many Schools and Colleges are following local business owners and making the switch to remanufactured and compatible non-genuine ink cartridges as they strive to take control of their printing budgets. We offer account facilities to many Schools and Colleges so contact us today for more details. All our products come with a money-back guarantee and we will gladly offer any advice on any concerns or reservations you may have about making the switch to compatible Brother laser toners.